Care of the legs and feet is essential for patients dealing with certain medical conditions. Patients who use compression footwear often suffer from health conditions which limit their ability to dress and undress themselves. The bending and dexterity required to remove and wear socks presents a unique challenge for patients who have arthritis, limited mobility, and diminished hand strength, as well as for those recovering from hip, knee, or back surgery. 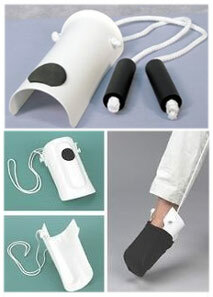 For these patients, there are many types of sock aids on the market which are helpful for removing and wearing socks. They make getting dressed, simpler and easier. One product frequently prescribed by physicians is compression socks or compression stockings. These socks, made from strong elastic, work by applying a squeezing action to the legs to prevent blood from pooling in the veins. They are useful in relieving the pain and swelling of varicose veins, to help heal sores on the skin and prevent them from returning, and in the treatment of blood clots in the legs. They are also helpful for those with compromised circulation, such as diabetics, and for patients whose work demands that they sit or stand in one place for long periods. Compression socks and stockings are priced anywhere from $25.00 to $110.00. The downside to these compression socks and stockings is that they require a lot of physical exertion and dexterity in order to wear one. Someone who requires help putting on socks will find that sock aids are a necessary part of the dressing up routine. Sock aids are generally soft-sided. The terrycloth-covered main portion of the device fits into the sock. The textured surface holds the sock in place. The opposing surface is satin, which allows the foot to slide smoothly into the sock. The two long loop handles allow the patient to pull the sock onto the foot with minimal effort. These useful devices typically cost from $12.00 to $18.00 and are available without a prescription. The patient’s doctor or physical therapist may also recommend a stocking donner to limit stress on the joints and to increase the patient’s independence in getting dressed. A stocking donner typically consists of a sturdy metal frame which is covered with a baked epoxy finish to prevent socks and stockings from snagging. The sock is positioned in the frame and then pulled onto the foot by using the foam grip handles. This device is particularly useful for patients with weakened hand strength or coordination. 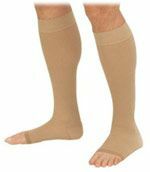 They are great for opening up compression stockings so one can easily slide their foot in. Prices for stocking donners run from $25.00 to $50.00 and they can be purchased without a prescription. After putting on your socks or stockings, be sure to use a device to help tie your shoelaces. For additional help maneuvering and reaching the socks and stockings, consider using a dressing stick, handicap reachers or a long-handled shoehorn. They make sock removal and pulling up of socks much easier with the use of hooks, pinchers and grabbers. Prices for these items range from $10.00 to $20.00. Check out our long list of recommended dressing equipment.